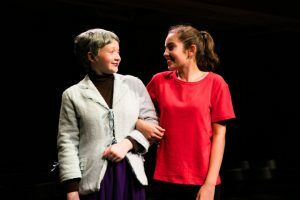 Traditionally at the end of Year 11, students have worked on performing a play in the last term of the school year. 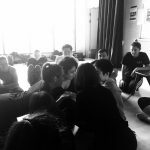 However, we felt that this was too insular and that the students would benefit more from practising theatre directly in the community we are a part of. 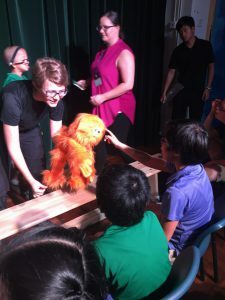 Theatre-in-Education (TIE) is a term coined in the 60’s and typically includes a theatre company performing in an educational setting (i.e. a school) for youth, including interactive and performative moments. 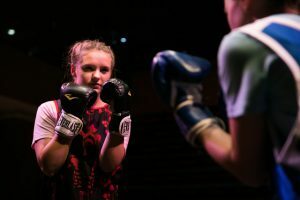 TIE seeks to educate young people on issues that are relevant to both them and their communities, for example; bullying, environmental preservation, and peer conflict resolution. So, this year we incorporated a new unit, with our Year 11 Drama class entirely focussed on TIE. 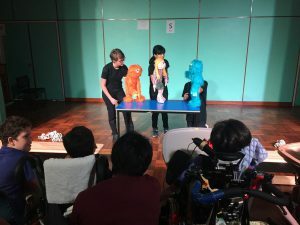 In collaboration with colleagues at Jockey Club Sarah Roe School (JCSRS) we built a new unit of learning which focusses on our DC students creating, performing and supporting original theatre works specifically designed for a young special needs audience, set into the current JCSRS learning unit of inquiry. The unit was focussed on the environment and had themes of ‘reduce, reuse and recycle’, and our responsibility to help the planet. 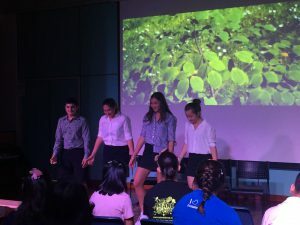 Our year 11 students researched the relevant issues, explored similar materials for the allocated age groups and then, in groups, created a short play with accompanying activity to support the learning. 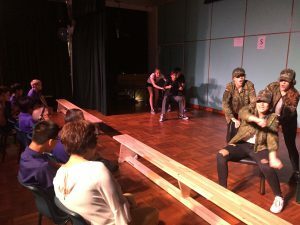 On the 5th of June, our two Year 11 Drama classes culminated the TIE unit with a trip to JCSRS to perform nine pieces of theatre and run their activities with across the age groups of 5-19. 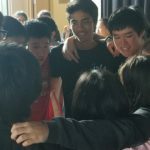 As our ESF sister school, the students at JCSRS all have complex learning needs, and yet all love Drama as much as our students do! Our students did a great job, and learned so much from the process. 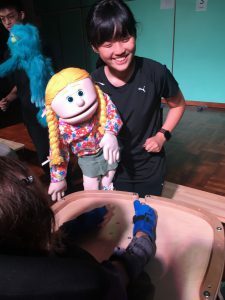 Their empathy, friendliness and teaching skills were heartwarming to watch, and the students at JCSRS all loved the performances and interaction with our students. 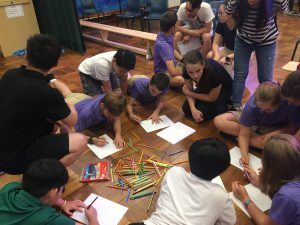 In response to the feedback received from the students, Holly Mannings, the arts coordinator at JCSRS, and I have decided this was a great unit of collaboration, and the community engagement aspect was truly valuable for both sets of students. 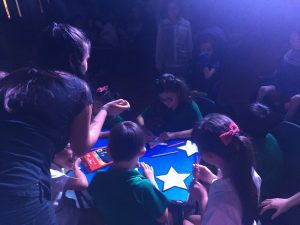 While the performances and activities were great, these were in groups, so while students were not on stage, there was little for them to do other than watch each other. Holly and I are already thinking of ways we can make more efficient use of the time we spend at JCSRS during the day, by having our DC students spend more time with specific classes, experience the Sensory Integration Room, and perhaps assist in the Living skills room or in the cafe run by their students. But for a first run, we are very pleased with the outcome of this unit – and as always I couldn’t be prouder of my year 11 Drama students! 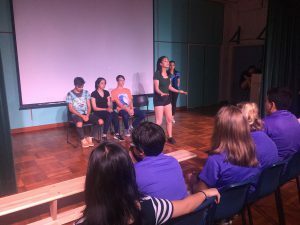 Lower Secondary Production 2018: ‘Ernie’s Incredible Illucinations’ by Alan Ayckbourn. 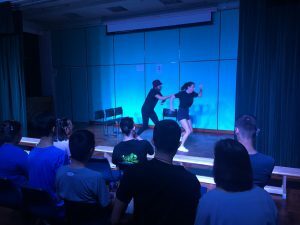 On the 3rd of May, the Lower secondary production was performed three times in one day, to a lively and engaged audience. 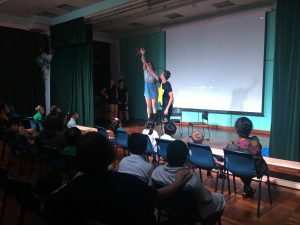 Our first audience during the official dress rehearsal were year 4 primary students, who cheered and laughed along with Ernie’s imaginings, while the afternoon and evening performances were to students, parents and staff attending, who were almost as enthusiastic as the youngest of year 4! Audiences smiled at the grandmother being rescued by the helicopter, whooped the knockout count of the boxer defeated by 68-year-old Aunty May, and gripped the edge of their seats as Mr Fraser rescued the librarian with the broken leg from the top of a mountain, and everyone tapped their feet to the glorious music of the infectious marching band that marched out of the doctor’s office. 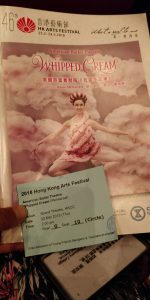 What wonderful performances the cast and crew put on! 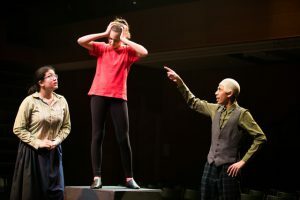 Although they made it look easy, there was a total of more than 18 contact hours with students in rehearsal and production meetings, and doubtless many more hours of line learning and setting up required out of these times. Parents have supported us throughout the process, and without their tireless encouragement for the students, we couldn’t have done it. 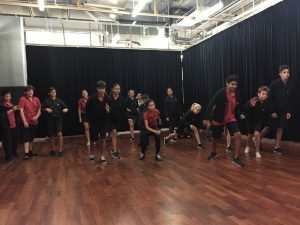 All students involved were from years 7–9, and several students were performing or holding production roles for the first time, and they took their responsibilities very seriously. 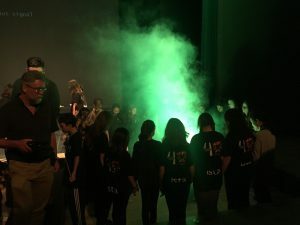 As a result, the stage crew helped all to run smoothly, the lights and sound created the perfect atmosphere and the students on stage performed superbly and really owned their work. The play is truly that of the students and we, as a Drama department, are so proud of them all. We hope to see all students carry these great collaborative skills on into future productions! 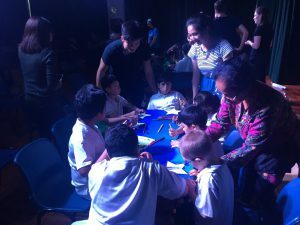 I would like to say that it was an absolute delight to see the children really enjoying and relishing the freedom theprocess – I don’t think that you can ask for more than that as a parent. Thanks to all for putting in the hours to bring these kids together and looking forward to the next production. A great achievement! We truly enjoyed the show yesterday!!! Well done for the teachers, crew and kids! I am Luiza’s mom and I must say she had a great time! But what stroke me is that all of them were really truly enjoying the moment and that created an engagement in the audience that was noticeable. Thank you so much for an excellent show! We watched it twice and I agree with you when you say that the kids thoroughly enjoyed every second of it. Thank you for igniting and nurturing a passion for Drama in Caleb…he was in his element! Just wanting to say a big thank-you for the show earlier this month. It really had a lot of punch! 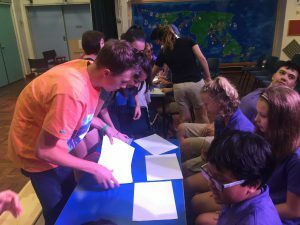 I loved the interactive nature and there was action here there everywhere – so thank-you and I know everyone appreciates the work of the DC teachers – working back late on projects such as this. 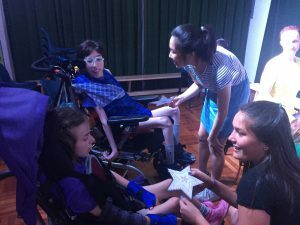 The thing I liked most about the production is getting to see what it is like backstage because this is the first time that I have been in a school play and also getting to make new friends because we get to talk to new people from different years. 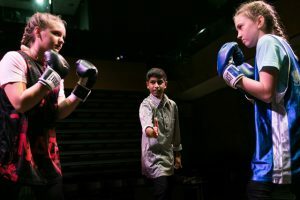 All year 7 students enjoyed a 2-hour workshop with Faust, focussed on stage fighting at the start of March. 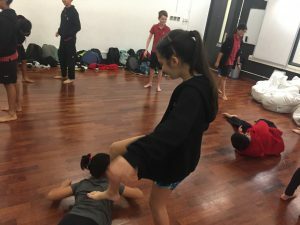 Matt and Ronja from Faust International Youth theatre company, joined us for two full days of teaching the students slapping, punching, choking and hair pulling, all for a fun way to explore stage fighting their next violent performances! The kids were superbly behaved, listened attentively and were highly engaged in a safe and fun way. 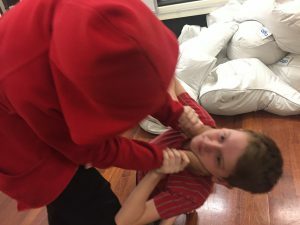 They were so good at fighting realistically that we gave them stern warnings not to scare their teachers and parents with these moves around school or at home! 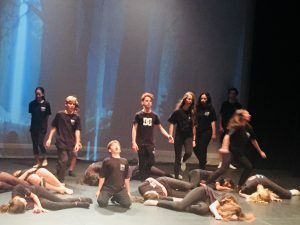 We hosted two evenings of Year 9 Duologue performances where all year 9 Drama students worked in pairs on an excerpt of a published play text; they memorised their lines, developed their characters and staged the piece themselves with lights, sound and set. Congratulations to all years ( students on an excellent debut to public performances -you all did a superb job!! 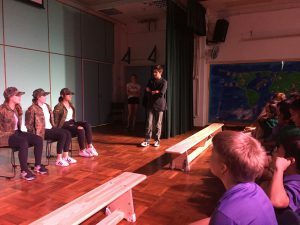 The evenings went smoothly with some great acting, smooth transitions and fabulous engagement from all. We’re so proud to see how far you’ve come this year! 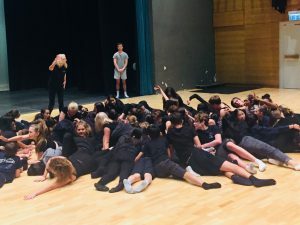 Year 10 Drama students have been studying Frantic Assembly, a UK theatre company known for their physical language and moving human pieces of strong, emotional theatre. 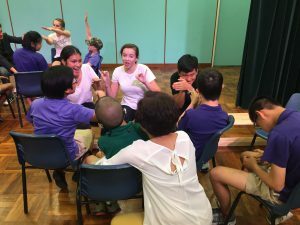 Students created their own theatre based on this style, incorporating chair duets, standing duets, and monologues into their personal creations. 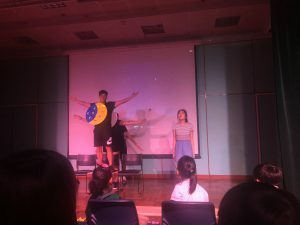 These were performed to an invited audience over the space of two evening performances and all left with a feeling of amazement at the students’ creativity and professional development. Well done to all Year 10 students on their penultimate performance of the year. Our wonderful Year 13 Diploma Theatre students performed their final component of the course, the Solo performances. 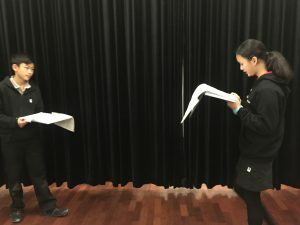 Formed with research into a theatre practitioner, students show how they can apply a theatre practice to either a published play or a piece of their own creation. 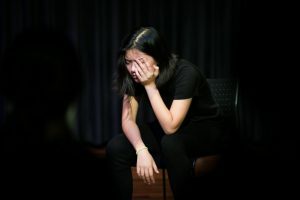 We had amazing performances to a live audience, based on Artaud, La Page, Wilson and Craig, with foci on set, lighting, projections and emotional response. A huge congratulations for the completion of the course -they have the final paperwork to submit, but their work here is done! We wish them all the best in their bright and shining futures! 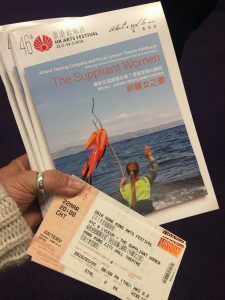 The Hong Kong Arts Festival is an amazing opportunity to see a range of great professional performances by theatre companies from all over the globe. 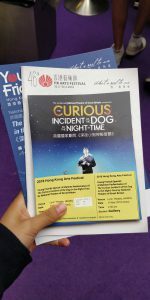 This year we teamed up with Young Friends organization to be able to offer students the chance to see a minimum of two performances for a ridiculously reduced price. 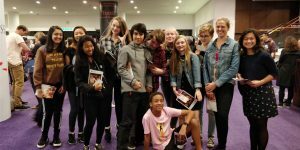 All of year 10 went to see a rehearsal of Whipped Cream by the American Theatre Ballet, while all year 11 students went to see National Theatre’s award-winning production of The Curious Incident of The Dog in the Night-time, after they had a workshop at school on the play, led by a Young Friends leader. 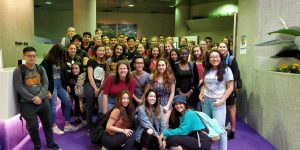 All students had the opportunity to join in with a further four theatre trips; Bosch Dreams, two viewings of The Pursuit of Happiness, and The Suppliant Women. 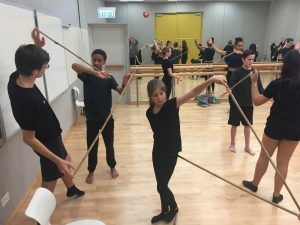 ISTA stands for the International Schools Theatre Association, a global educational theatre company with strong links to the IB, and they have recently established a base in Hong Kong. 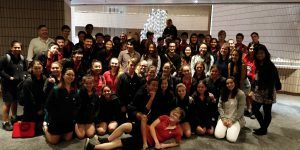 Last weekend they celebrated 40 years of school festivals, and Hong Kong Academy hosted 80 students from 9 schools in Hong Kong for their 2-day festival titled ‘Come Together’. 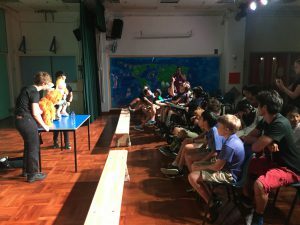 We had 6 DC students participate, from both primary and secondary, and in the space of a day and a half they created an incredible, fully formed production for an audience. This experience never fails to amaze me -the students start working with kids they’ve never met before, and led by ensemble leaders they create the most visual and physical work that, under the guidance of an Artistic director, is formed into a dynamic performance with lights, sound, projections, and even a live band accompaniment! Well done to these students who dedicate their entire weekend to this festival -you did a fantastic job, and you are true artists in the making! I know for a fact you each loved this festival and will be sure to join future events – I look forward to going with you! 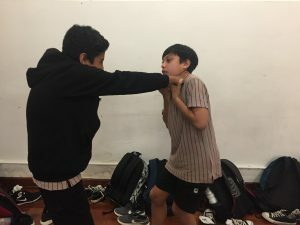 So these are all the main events we have seen happen this eventful March, but all have happened alongside the continuation of the regular events, like classes and Lower secondary production rehearsals twice a week. 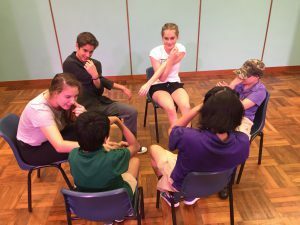 The production is coming along nicely – as a Director my aim to is to give the students involved as much ownership over this play as I can -and their ideas have continued to pour in, demonstrating how innovative and creative these wonderful students are. This is going to be a great show! I would like to offer family and friends the opportunity to walk into any of our rehearsals to see how we work. You are always welcome -only please realise you are letting yourself into spoiler alerts!! In any case, we look forward to welcoming you to one of the shows held on the 3rd of May. We know you’ll think it’s ‘incredible’! 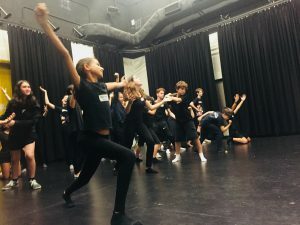 All of the events in the Theatre and Drama studios lead to a lot of mess, so this term we are starting up our brand new after-school club of ‘Stage managers galore’. Every Tuesday a dedicated group of volunteers come to tidy and manage the rooms, props, costumes and spaces we use for Drama. Thank you to those who signed up! 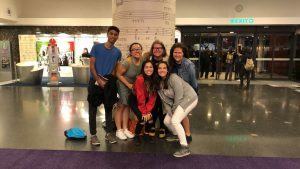 The students who show dedication and commitment to DC secondary theatre have the greatest chance of becoming a DC Drama captain in the future. 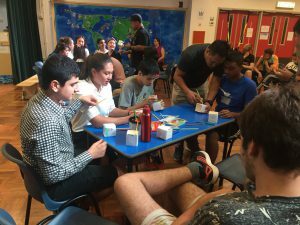 Each year we have one student from year 11 chosen to work with the captain from year 12 to run our events. 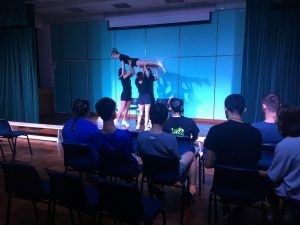 Drama captains manage the spaces, run lights and sound at evening and daytime performances, support the Secondary school productions, and led a whole host of events. We are very grateful for the dedicated work of our current captains; Leticia and Csende – Thank you!!!! 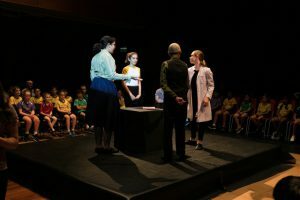 This term we welcome a workshop for Y8 students by the world-renowned UK theatre company, Trestle. 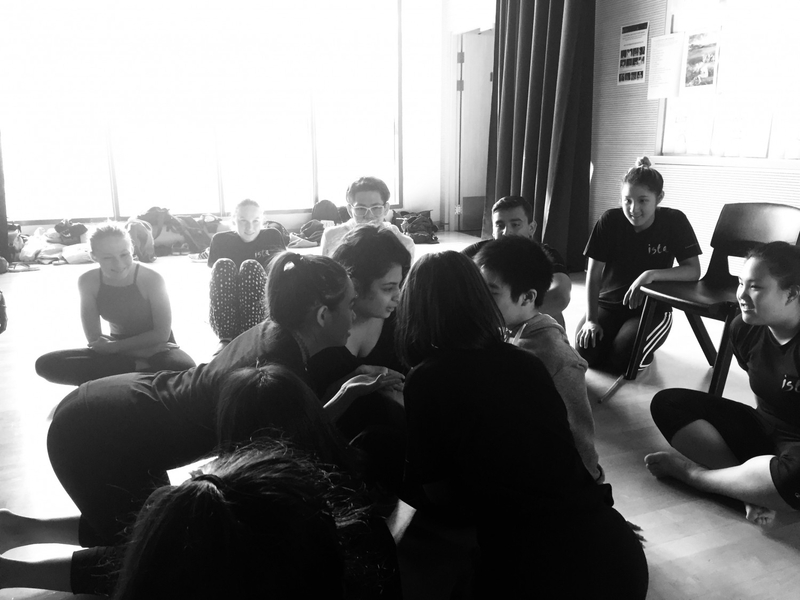 This company makes and performs with masks, and as well as a teacher workshop, DC is inviting the actors to lead a workshop for our year 8 students, coinciding perfectly with their unit of learning on Masks. 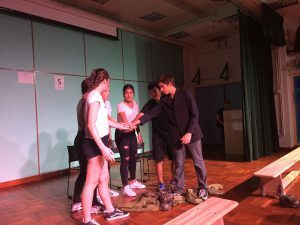 Year 11 are launching a brand new Drama unit this year. 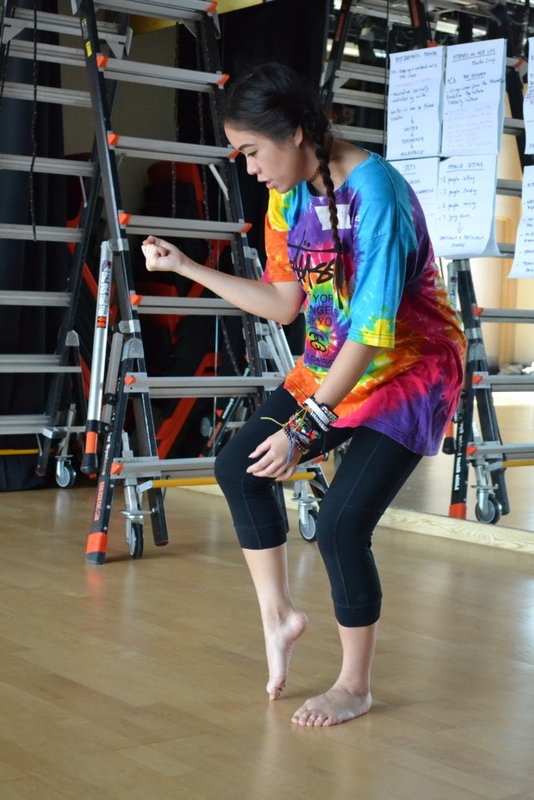 Replacing the performance of a full-length play, this unit will be deeply embedded in our community of ESF schools. 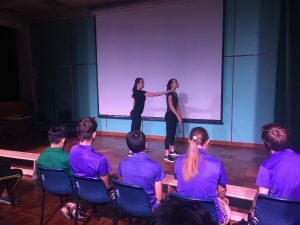 Our year 11 students are creating their own pieces of theatre, supported by an activity, to bring to Jockey Club Sarah Roe school as Theatre in Education. JCSRS is our ESF sister school for differently abled children, who have special learning needs. 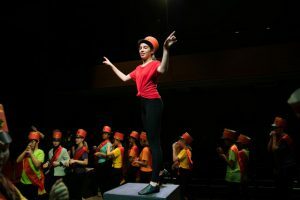 Our students have studied Sarah Roe’s unit plan of ‘We are the World’ and they have designed theatre pieces which complement the inquiry of their target audiences, even creating an activity to play with their audience to support the performance of their play. Students will be taken to JCSRS on the 5th of June, and I am sure both our students and JCSRS students will enjoy and benefit greatly from this unit of learning. I am really looking forward to these pieces! 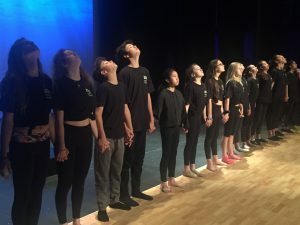 Thanks to all the commitment and enthusiasm of all our Drama kids – you are helping to grow this department and making us shine brightly as the stars we all are! We look forward to sharing with you again soon! 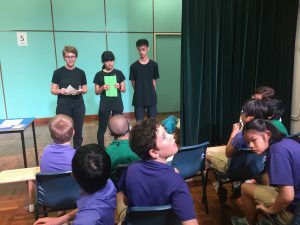 On the 6th of February, Secondary students were given a chance to participate in House Drama, a competition in which students from years 7 to 13 were challenged to quickly create a short piece and perform it. 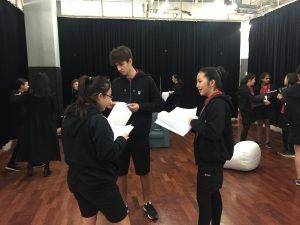 The students were split into two groups and were provided with an object that would have to be the focus of their piece. The performers were also required to include three tableaux and two spoken thoughts. 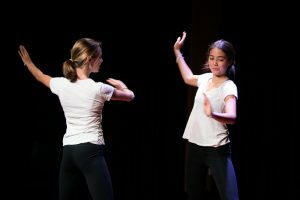 With only nine minutes to create the piece, both groups worked quickly and ended up creating two very contrasting performances. Many of the Houses had to be mixed to create even teams, but it was eventually decided that Purple House had won.